The Slavic languages (also called Slavonic languages), a group of closely related languages of the Slavic peoples and a subgroup of Indo-European languages, have speakers in most of Eastern Europe, in much of the Balkans, in parts of Central Europe, and in the northern part of Asia. Some linguists speculate that a North Slavic branch has existed as well. The Old Novgorod dialect may have reflected some idiosyncrasies of this group. On the other hand, the term "North Slavic" is also used sometimes to combine the West and East Slavic languages into one group, in opposition to the South Slavic languages, due to traits the West and East Slavic branches share with each other that they do not with the South Slavic languages. The most obvious differences between the West and East Slavic branches are in orthography of standard languages; West Slavic languages are written in the Latin alphabet, and have had more Western European influence due to their speakers being historically Roman Catholic, whereas the East Slavic languages are written in the Cyrillic alphabet and with Eastern Orthodox or Uniate faithful, have had more Greek influence. The tripartite division of the Slavic languages does not take into account the spoken dialects of each language. Of these, certain so-called transitional dialects and hybrid dialects often bridge the gaps between different languages, showing similarities that do not stand out when comparing Slavic literary (i.e., standard) languages. For example, Slovak (West Slavic) and Ukrainian (East Slavic) are bridged by eastern Slovak dialects, Rusyn, and western Ukrainian dialects. Polish has similar transitionality with both western Ukrainian and Belarusian dialects. Although the Slavic languages split from a common proto-language later than any other group of the Indo-European language family, enough differences exist between the various Slavic dialects and languages to make communication between speakers of different Slavic languages difficult. Within the individual Slavic languages, dialects may vary to a lesser degree, as those of Russian, or to a much greater degree, as those of Slovenian. Area of Balto-Slavic dialectic continuum (purple) with proposed material cultures correlating to speakers Balto-Slavic in Bronze Age (white). All Slavic languages descend from Proto-Slavic, their immediate parent language, ultimately deriving from Proto-Indo-European, the ancestor language of all Indo-European languages, via a Proto-Balto-Slavic stage. During the Proto-Balto-Slavic period developed a number of exclusive isoglosses in phonology, morphology, lexis and syntax with Baltic languages, which makes them the closest of all the Indo-European branches. The secession of the Balto-Slavic dialect ancestral to Proto-Slavic is estimated on archaeological and glottochronological criteria to have occurred sometime in the period 1500-1000 BCE. A minority of Baltists maintain the view that the Slavic group of languages differs so radically from the neighboring Baltic group (Lithuanian, Latvian, and the now-extinct Old Prussian), that they could not have shared a parent language after the breakup of the Proto-Indo-European continuum about five millennia ago. Substantial advances in Balto-Slavic accentology that occurred in the last 3 decades make this view however very hard to maintain nowadays, especially when one takes into account the fact that there was most likely no "Proto-Baltic" language, and that West Baltic and East Baltic differ from each other as much as each of them does from Proto-Slavic. The imposition of Church Slavonic on Orthodox Slavs was often at the expense of the vernacular. Says W.B. Lockwood, a prominent Indo-European linguist: "It [O.C.S] remained in use to modern times, but was more and more influenced by the living, evolving languages, so that one distinguishes Bulgarian, Serbian, and Russian varieties. The use of such media hampered the development of the local languages for literary purposes and when they do appear the first attempts are usually in an artificially mixed style." (148) Lockwood also notes that these languages have "enriched" themselves by drawing on Church Slavonic for the vocabulary of abstract concepts. The situation in the Catholic countries, where Latin was more important, was different. The Polish Renaissance poet Jan Kochanowski and the Croatian Baroque writers of the 16th century all wrote in their respective vernaculars (though Polish itself had drawn amply on Latin in the same way Russian would eventually draw on Church Slavonic). Although Church Slavonic hampered vernacular literatures, it fostered Slavonic literary activity and abetted linguistic independence from external influences. Only the Croatian vernacular literary tradition nearly matches Church Slavonic in age. 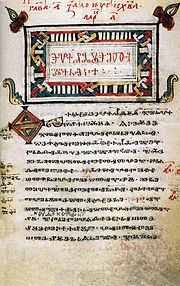 It began with the Vinodol Codex and continued through the Renaissance until the codifications of Croatian in 1830, though much of the literature between 1300 and 1500 was written in much the same mixture of the vernacular and Church Slavonic as prevailed in Russia and elsewhere. The most important early monument of Croatian literacy is the Baška tablet from the late 11th century. It is a large stone tablet found in the small church of St. Lucy on the Croatian island of Krk , containing text written mostly in Čakavian dialect of in angular Croatian Glagolitic script. The independence of Dubrovnik facilitated the continuity of the tradition. The languages of the Catholic Slavs tottered precariously near extinction on many occasions. The earliest Polish is attested in the 14th century; before then, the language of administration was Latin. Czech was always in danger of giving way to German, and Upper and Lower Sorbian, spoken only in Germany, have nearly succumbed just recently. Under German and Italian for many centuries, the Slovene language was a regional language spoken by peasants, and was brought to written standards only by the followers of the Reformation in the 16th century. More recent foreign influences follow the same general pattern in Slavic languages as elsewhere, and are governed by the political relationships of the Slavs. In the 17th century, bourgeois Russian (delovoi jazyk) absorbed German words through direct contacts between Russians and communities of German settlers in Russia. In the era of Peter the Great, close contacts with France invited countless loan words and calques from French, a significant fraction of which not only survived, but replaced older Slavonic loans. In the 19th century, Russian influenced most literary Slavic languages by one means or another. Croatian writers borrowed Czech words liberally, whereas Czech writers, scrambling to revive their dying language, had in turn borrowed many words (cf. vzduch, air) from Russian. The Proto-Slavic language existed approximately to the middle of the first millennium AD. By the 7th century, it had broken apart into large dialectal zones. There are no reliable hypotheses about the nature of the subsequent breakup of West and South Slavic. East Slavic is generally thought to converge to one Old Russian language, which existed until at least the 12th century. It is now believed that South Slavs came to the Balkans in two streams. Linguistic differentiation received impetus from the dispersion of the Slavic peoples over large territory, which in Central Europe exceeded the current extent of Slavic-speaking majorities. Written documents of the 9th, 10th and 11th centuries already have some local linguistic features. For example the Freising monuments show a language which contains some phonetic and lexical elements peculiar to Slovene dialects (e.g. rhotacism, the word krilatec). The movement of Slavic-speakers into the Balkans in the declining centuries of the Byzantine empire expanded the area of Slavic speech, but pre-existing writing (notably Greek) survived in this area. The arrival of the Hungarians in Pannonia in the 9th century interposed non-Slavic speakers between South and West Slavs. Frankish conquests completed the geographical separation between these two groups, also severing the connection between Slavs in Moravia and Lower Austria (Moravians) and those in present-day Styria , Carinthia , East Tyrol in Austria and in the provinces of modern Slovenia , where the ancestors of the Slovenes settled during first colonisation. Slavic languages have a substantial number of palatal and palatalized consonants, often forming pairs with related non-palatalized consonants. All Slavic languages are fusional, having a rich morphology largely as a result of conserving the inflectional morphology of Proto-Indo-European. Similarly, Slavic languages exhibit extensive morphophonemic alternations in their derivational and inflectional morphology including between velar and postalveolar consonants, front and back vowels, and between a vowel and no vowel. In all Slavic languages, most verbs come in pairs with one member having an imperfective aspect and the other having a perfective one. Complex consonant clusters as in the Russian word встретить ('to encounter'). Most languages of the former Soviet Union , Russia and neighboring countries (for example, Mongolian) are significantly influenced by Russian, especially in vocabulary. In the south, the Romanian, Albanian and Hungarian languages witness the influence of the neighboring Slavic nations, especially in the vocabulary pertaining to urban life, agriculture, crafts and trade—the major cultural innovations at times when few long-range cultural contacts took place. In each one of them Slavic lexical borrowings represent at least 20% of the overall vocabulary. Romanian language in particular shows strong and profound Slavic influences at all levels, including phonetics, syntax and grammar. This situation is due to the fact that Slavic tribes crossed and partially settled the territories inhabited by ancient Illyrians and Vlachs on their way to the Balkans. Despite a comparable extent of historical proximity, the Germanic languages show fewer significant Slavic influence partly because Slavic migrations were mostly headed south rather than west. Due to political reasons, there is a tendency to diminish Slavic contributions to Germanic languages. For instance, Max Vasmer has claimed that there are no Slavic loans into Common Germanic. The only Germanic language that shows significant Slavic influence is Yiddish. However, there are isolated Slavic loans into other Germanic languages. For example the word for "border", in modern German Grenze, Dutch grens was loaned from the Common Slavic *granica. English derives quark (a kind of cheese, not the subatomic particle) from the German Quark, which in turn is derived from the Slavic tvarog, which means "curd". Many German surnames, particularly in Eastern Germany and Austria, exhibit Slavic origins. Swedish also has torg (market place) from Old Russian tъrgъ, tolk (interpreter) from Old Slavic tlŭkŭ, and pråm (barge) from West Slavonic pramŭ. The Czech word robot is now found in most languages worldwide, and the word pistol, probably also from Czech, is found in many Indo-European languages, including Greek (πιστόλι, pistóli). A well-known Slavic word in almost all European languages is vodka, a borrowing from Russian водка (vodka), lit. "little water", from common Slavic voda (water, cognate to the English word) with the diminutive ending -ka. Owing to the mediæval fur trade with Northern Russia, Pan-European loans from Russian include such familiar words as sable The English word vampire was borrowed (perhaps via French vampire) from German Vampir, in turn derived from Serbian vampir, continuing Proto-Slavic * pyrь, although Polish scholar K. Stachowski has argued that the origin of the word is early Slavic *vąpěrь going back to Turkic *oobyr. During the heyday of the USSR in the 20th century, many more Russian words became known worldwide: da, soviet , sputnik, perestroika, glasnost, kolkhoz, etc. Church Slavonic language, derived from Old Church Slavonic, but with significant replacement of the original vocabulary by forms from the Old Russian language and other regional forms. The Bulgarian Orthodox Church, Russian Orthodox Church, Polish Orthodox Church, Macedonian Orthodox Church, Serbian Orthodox Church, and even some Roman Catholic Churches in Croatia continue to use Church Slavonic as a liturgical language. While not used in modern times, the text of a Church Slavonic Roman Rite Mass survives in Croatia and the Czech Republic , which is best known through Janáček's musical setting of it (the Glagolitic Mass). cf. with references. "Classical glottochronology" conducted by Czech Slavist M. Čejka in 1974 dates the Balto-Slavic split to -910±340 BCE, Sergei Starostin in 1994 dates it to 1210 BCE, and "recalibrated glottochronology" conducted by Novotná & Blažek dates it to 1400-1340 BCE. This agrees well with Trziniec-Komarov culture, localized from Silesia to Central Ukraine and dated to the period 1500–1200 BCE. cf. : Deutsches Wörterbuch von Jacob Grimm und Wilhelm Grimm. 16 Bde. [in 32 Teilbänden. Leipzig: S. Hirzel 1854-1960. ], s.v. Vampir; Trésor de la Langue Française informatisé; Dauzat, Albert, 1938. Dictionnaire étymologique. Librairie Larousse; Wolfgang Pfeifer, Етymologisches Woerterbuch, 2006, p. 1494; Petar Skok, Etimologijski rjecnk hrvatskoga ili srpskoga jezika, 1971-1974, s.v. Vampir; Tokarev, S.A. et al. 1982. Mify narodov mira. ("Myths of the peoples of the world". A Russian encyclopedia of mythology); Russian Etymological Dictionary by Max Vasmer.